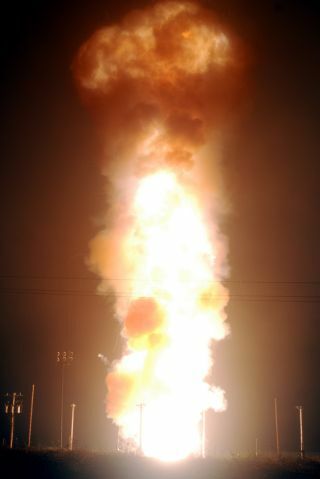 The U.S. Air Force test launched a Minuteman 3 intercontinental ballistic missile on June 30, 2010 at 3:40 a.m. EDT from the Vandenberg Air Force Base in California. Full Story. The United States Air Force launched an intercontinentalballistic missile (ICBM) on a test flight early Wednesday, sending the weapon on a suborbital trajectory that reached thousandsof miles downrange over the Pacific Ocean. The Minuteman 3 ICBM blasted off from a silo at California'sVandenberg Air Force Base at 3:40 a.m. EDT (0740 GMT) on routine test flightthat was monitored by analysts at the U.S. Department of Defense and theDepartment of Energy. Data from the test will be used to determine thereadiness of the U.S. military's ICBM fleet. The launch sent the Minuteman 3's single re-entry testvehicle about 4,200 miles (6,759 km) across the Pacific Ocean to apre-designated target near the Kwajalein Atoll in the Marshall Islands. Theatoll is home to the U.S. Army's Ronald Reagan Ballistic Missile Defense TestSite. "These launches teach us a great deal and require ateam approach," said Air Force Col. Carl DeKemper, the 576th Flight TestSquadron commander and mission director, in a statement. "The launch waspart of our continuous self-assessment of the technical and weapons systemexpertise of our Airmen and the powerful capability of the ICBM fleet." Wednesday's test marked the second this month of the AirForce's Minuteman 3 missile. An earlier test launched from Vandenberg on June16. ? The Minuteman 3 intercontinentalballistic missiles have a range of more than 6,000 miles (9,656km) and can travel at speeds of up to Mach 23 (15,000 mph or 24,000 kph) andreach heights of up to 700 miles (1,120 km) above Earth. That means that Minuteman 3 missiles fly higher than theInternational Space Station, which orbits Earth at an altitude of about 220miles (354 km), when they hit the peak of their trajectories. Minuteman 3 ICBMs were first produced in June 1970, withproduction stopping in December 1978, according to the Air Force fact sheet. TheMinuteman weapons system was first conceived of in the late 1950s as a strategicweapon with an intercontinental range to serve as strategic deterrent forcefor the U.S. military. The missiles are housed in hardened underground silos andare watched over 24 hours a day by launch crews consisting of two officers pershift. The first Minuteman 1 missiles were deployed in the late 1960s. Today, Air Force's Minuteman weapon arsenal consists of450 Minuteman 3 ?missiles located at bases in Montana, Wyoming and NorthDakota, according to an Air Force fact sheet. The missiles are made of threedistinct stages that, when assembled, stand about 60 feet (18 meters) tall andweigh 79,432 pounds (32,158 kg). The ICBM test flight also marked the 1,900th launch fromVandenberg Air Force Base since 1957. ?The Air Force's 576thFlight Test Squadron, 341st Missile Wing and 30th Space Wing all contributed tothe test flight, Air Force officials said.